Inner Sounds is happy to present ~Wellness Wednesdays~ monthly sound baths attuned to the unique astrological and seasonal influences specific to the time. The Spring Equinox is a point of union and balance, poised between opposite forces: light and dark, receptive and active, unconscious and conscious, inner and outer. This is a time of joining opposite forces to create a blending of energy that is alive, potent and expansive. From this dynamic joining of opposites comes new life, transformation and manifestation. This very special Spring Equinox falls serendiptiously on the FULL MOON ehancing all of it's innate qualities of growth, illuminance, creativity, and mobilizing ideas into furition. Let's utilize this special combination of balanced expansion allows us to begin the spring season with an activated, sustainable start. Parking is ample and this venue is wheelchair accessible. More details to come with confirmation of registration. Meditate with ease, feel a deep sense of an inner calm and become present to your inner self while being immersed in healing frequencies and washes of cleansing overtones of 4-7 planetary gongs, quartz crystal bowls, melodic chimes, ocean drums, and other healing instruments. Inner Sounds Meditation's sound experiences are focused on restoring the nervous system, therefore, each sound bath has a limited amount of participants to ensure each person has adequate space and a distraction free environment. Learn more about sound meditations here. No yoga is practied, simply lie down (or sit) comfortably and listen to live sounds. Open to all ages 12 and up. Imagine feeling a clearer, lighter, and a ustaining calm for the remainder of your week and weekend. Most participants state they feel a dinstinct sense of calm for several days following a sound meditation and also sleep soundly for several nights. Journey inward with coloful visuals and dreamlike states. I used sound as therapy to erradicate a vicious cycle of anxiety and depression I experienced after my father fell severely mentall ill. Through utilizing sound as therapy, I was able to retrain my body and mind to rest and create new space to metabolize the traumatic experience of losing my father. Learn more about my story here. 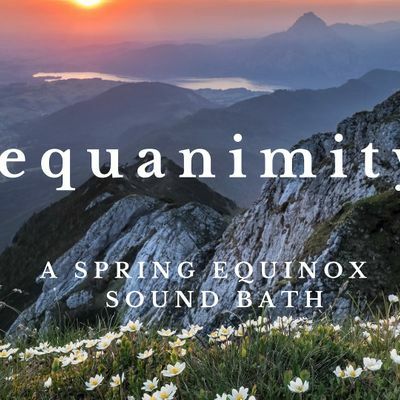 A sound meditation "bath" is an immersive live sound performance with specially tuned high-quality instruments that can lead to deeply meditative, difficult to reach Theta brainwave states, typically reserved for students with ten years of meditation practice. During the theta brainwave state, expect to feel a spacious and calm mind, relaxed body, and an ability to enter an innerscape that can lead to heightened intuition, insight, self-discovery, emotioanl release, and a distinct sense of wholeness. Melissa's sound meditation baths are focused on restoring the nervous system through deep relaxation. Therefore, each sound bath has a limited amount of participants to ensure each person has adequate space, sufficient props, and a distraction free environment. Most participants choose to lay down down but it can be experienced seated. No yoga is practiced. Your attire will not impact your sound meditation experience but comfortable clothes can enhance your ability to relax. After a short welcome and explanation of how you may feel during a sound bath, Melissa will use her restorative expertise to skillfully guide you in setting yourself up comfortably while lying down so you can have the best experience possible. You will then deeply relax in an immersive environment of live sound and vibration played by Melissa with specially tuned gongs, chimes, and quartz crystal singing bowls for about sixty minutes. Then, you will be slowly guided up to a comfortable seat for a closing silent meditation. Total experience is around 90 minutes. ​​Participants have often reported experiencing colorful visuals, emotional release, muscular tension relief, mood elevation, and a deep inner calm. Many enter meditative states and receive transformative insight. Sound therapy is highly effective at providing relief for chronic pain, digestive issues, insomnia, fibromyalgia, autoimmune disorders, heart's disease, trauma, depression, fertility issues, anxiety and cancer treatment therapies.